I’ll never need it, so why should I give…why should I donate blood? There are approximately 20,000 patients a year that are treated with the lifesaving products that generous donors give every day in the Delmarva region that could probably easily answer that question. But how does that affect you? Why should you be concerned? You’ve never needed blood. Are you absolutely sure that one of those 20,000 patients won’t be a family member, friend, neighbor or even yourself? Of course not, because none of us can predict what’s going to happen in the next five minutes, hours, days or years. Accidents don’t happen because people want them to, that’s why they’re called accidents and that’s why the Blood Bank of Delmarva works tirelessly every day to be prepared. It’s not my intention to sound alarmist, but this is why it’s critical that Blood Bank of Delmarva continuously collects the blood that supplies all the hospitals in our area, the hospitals you or your family members would be taken to should an emergency occur. We don’t take vacations, we don’t take extended holidays because EVERY DAY blood needs to be collected so that it’s ready on hospital shelves to be transfused when the next serious incident happens. But collecting this lifesaving gift is not simply for the purposes of disaster or trauma. Blood is used to treat a variety of illnesses and diseases: leukemia, those with blood disorders like sickle cell disease, cancer patients, surgical patients, burn victims and so many others. Blood is also used to treat women who experience severe blood loss during childbirth. In fact, complications connected with childbirth can be, per incident, responsible for some of the highest usages of blood. In a rare case in San Antonio, Texas, a woman was given an astonishing 540 units (35 gallons) of blood after delivery complications. Thankfully, she is alive today and raising her child thanks to the selfless act of hundreds of blood donations from complete strangers. We simply call them heroes. But why is it important for YOU to give? You first need to understand that approximately 65% of the US population cannot donate blood. Think about it, that means if you’re in a room with three people only one of the three has the ability to donate…not great odds. Potential donors are deferred from donation for a number of reasons from travel to certain medications and vaccinations, medical conditions, lifestyle and life events and a host of other causes. Of the population that remains eligible to donate, only a small percentage, much less than 10 percent actually do. What’s even more concerning for those of us in the blood industry is that the average age of a blood donor is increasing every day. If blood centers across the country aren’t successful in recruiting younger donors, there may come a time when there won’t be anyone left to donate. And since modern science has yet to develop a substitute for human blood, the results could be devastating. Because of the criticality of our mission, we must do everything in our power to make sure that never happens. With that, please allow me to go back to my original question…Why Should You Give? That last point is something that will give you great personal satisfaction and directly impact another human being. Blood donation is the most personal and most important gift you’ll ever give, because you’re giving of yourself…literally! 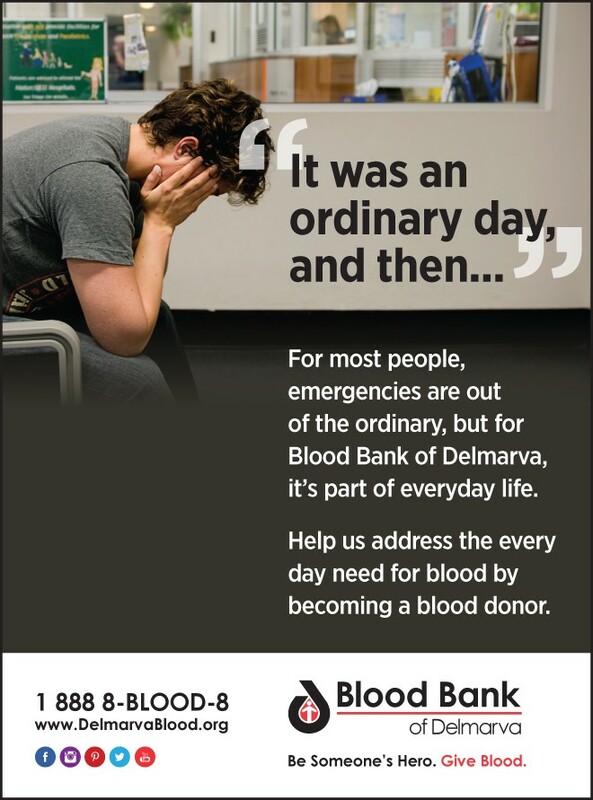 If you’re interested in becoming one of our Heroes, call 1-888 8-BLOOD-8 or visit our website: www.DelmarvaBlood.org. We also have a convenient mobile app you can download free. Next Story → Good Imaging Saves Lives!